CAPE TOWN, South Africa (CNS) — Feeding children to prevent them dropping out of school is a priority for the church in Ethiopia, which is experiencing its worst drought in about 50 years, a church worker said. “Children don’t go to school if they have empty stomachs,” Argaw Fantu, regional director for the Catholic Near East Welfare Association, told Catholic News Service March 11 in a telephone interview from Addis Ababa, Ethiopia’s capital. “We have limited resources and so we have had to focus on the northern parts of the country” where the effects of the drought are worst, “but we heard yesterday of a school in the southern diocese of Hosanna where 236 of its 552 pupils have dropped out because of hunger,” Fantu said. More than 10 million people of Ethiopia’s population of around 100 million require emergency humanitarian food assistance because of the El Nino-driven drought. With more than 83 percent of Ethiopians living in rural areas, where most rely on rain-fed agriculture, “the bulk of our assistance is to people in rural areas,” said Matt Davis, Catholic Relief Services’ representative in Ethiopia. While soaring food prices due to shortages “have put food out of many people’s reach in urban areas, food is still available in markets” in the cities and towns, he said March 10 from Addis Ababa. “If we are able to provide sufficient relief now, in these dire circumstances,” the drought will cause the country to “take only one step back and then continue on the development track it has been on for the past decade,” Davis said. Ethiopia has long been one of the world’s poorest countries, but with rapid industrialization it has had double-digit growth for the past 10 years. “The commitment of the church in Ethiopia is tremendous, and it punches above its weight,” Davis said, noting that only 1 percent of Ethiopia’s population is Catholic, yet the church is the second-largest provider of health and education services, after the government. With strengthened social protection and other systems, Ethiopia “is far more resilient than it was in the 1980s, when hundreds of thousands of people died” of famine-related causes, he said. “We’re not going to see that in 2016,” he said. The emergency response programs are particularly important because, as well as providing food, they protect “families from being dispersed” and save “the youth from migration,” the Catholic Bishops’ Conference of Ethiopia said in a Dec. 22 statement, signed by its president, Cardinal Berhaneyesus Souraphiel of Addis Ababa. “It is not difficult to imagine the fate” of young people among the displaced “taking the risk of migrating to other countries through illegal means in search of work and a better life,” the bishops said. “With food shortages, it’s always the young people who try to move away,” Fantu said. 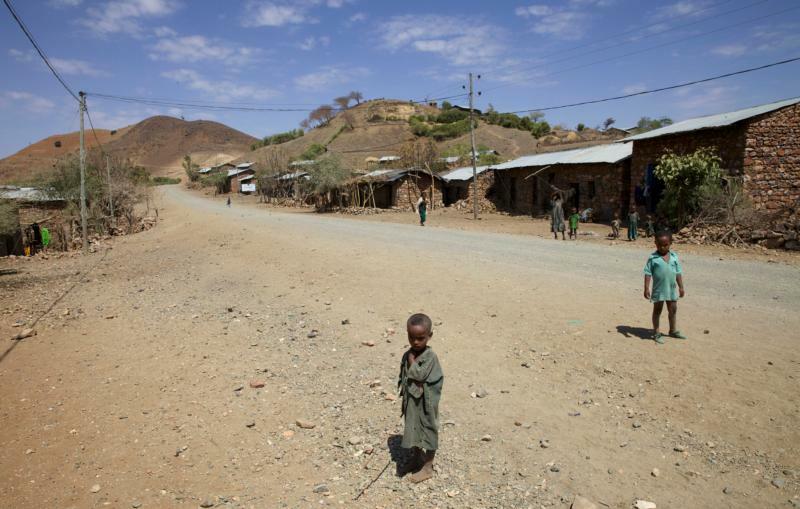 “To avoid this, we are trying to meet their food needs where they are” in the rural areas, he said, noting that children as young as 10 years old are coming to Ethiopia’s cities, where they beg for food and money. “In some places, we have turned rural Catholic schools into temporary feeding centers,” he said. Agricultural development programs are in place and a normal rain year is expected, “which will give farmers the opportunity to plant,” he said. Noting that the state has invested in infrastructure such as early warning systems to track the threat of famine, Davis said that “the government has taken leadership, and this is a collective effort to make sure that the damage does not push the country off its track” of progress.